If you want to know how to recognize text in image instantly, please refer to this article which is about how to use VeryPDF Screen OCR to recognize text in image with OCR technology. 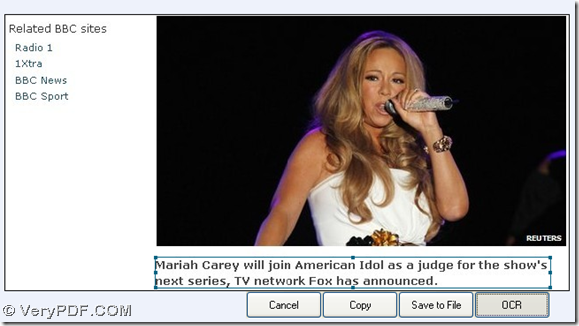 VeryPDF Screen OCR helps you recognize text in image and screen accurately. Besides, VeryPDF Screen OCR allows you to generate various dimensions and content screen snapshots due to your requirement. 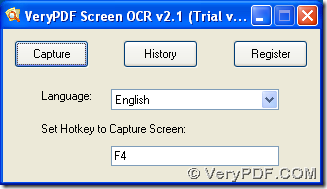 More information of VeryPDF Screen OCR can be known at homepage of VeryPDF Screen OCR. 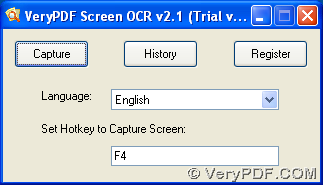 Free trial version of VeryPDF Screen OCR can be downloaded at here. To use OCR technology to recognize text of specified in rectangle in image, please click OCR button. Of course, if you want to copy the snapshot in rectangle, please click Copy button, likely, please click save to file for saving this rectangle snapshot in default folder of VeryPDF Screen OCR. Then, this extract content could be automatically saved in default folder of VeryPDF Screen OCR. To save this content in another folder, please click File > save text as > choose one folder as objective folder > click save, then system can pop out a dialog box that tells you it is successful to save this text file after you recognize text in image with OCR technology. By now, it is the end of the description to recognize text in image with OCR technology of VeryPDF Screen OCR in Windows systems of both 32 bits and 64 bits. For more concerns about this software – VeryPDF Screen OCR and this article, please feel free to let our support team know right away. This entry was posted in Screen OCR and tagged OCR technology. Bookmark the permalink.